In the early hours of Sunday morning Lawrence police and fire were called to Chester Street for a car crashed into a house. 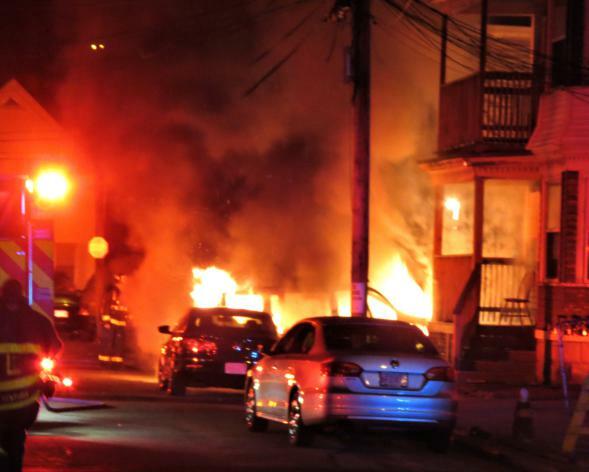 Within seconds of the first radio call, another emergency was dispatched that the car had caught fire and the fire was spreading to the house. As firefighters worked diligently to put out the fire that melted away the siding on the home it crashed into, police talked to witnesses who said that the car had only crashed after being hit by another car that did not stop. Lawrence police searched the area for a car with MA Firefighter plates as the hit and run vehicle. Within a few short minutes officers found the car still running inside a garage on South Bowdoin Street (just six blocks away) with the driver still inside. Police called for assistance from the fire department to get into the garage, located the suspect and put him in an ambulance after he claimed to feel dizzy upon being caught. B.s. Tom Duggan stop reporting fallacies you could do so much better as a person if you took people’s feelings into account before you printed this crap my two year old grandson could do a better job of reporting if he could read or write. Oh wait I have a great idea I could just write down what I think he said and put my own twist on it. Isn’t that what you do on the daily. It appears to me that “David” probably knows the criminal involved. Hey Tom, don;t forget to take people’s feelings into account before you report something. Cuz you know, every other news outlet does that stuff. CNN, FOX all those folks call up the criminals, victims and witnesses to get the full story before running it. They don’t want to upset anyone, and heaven forbid someone actually cries or feels offended. If you know its not accurate now , why not retract the story and tell the truth ?